In the aftermath of the “flash crash”, which saw the Dow plunge nearly 1,000 points in just a few minutes, a company called Namex spent weeks digging into the market recordings, replaying the day’s trades and trying to understand what happened. 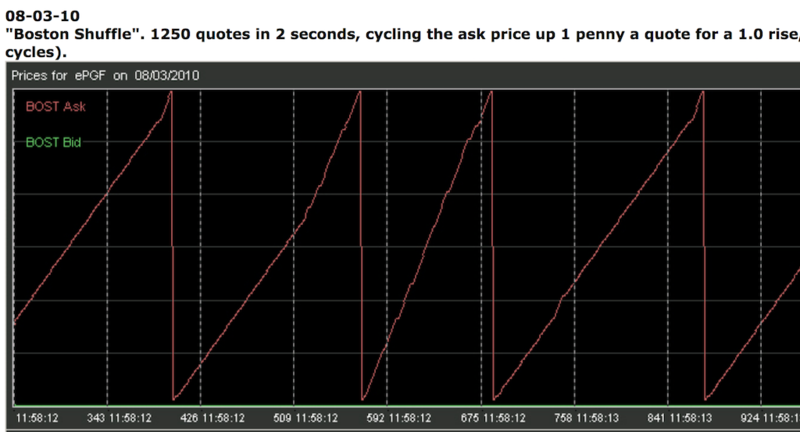 Jeffrey Donovan (an engineer at Nanex) came up with the idea to plot the action around a stock sequentially at the millisecond range. When he tried it, he was blown away by the pattern. He called it “The Knife. “When I pulled up that first chart, we saw ‘the knife,’ we said, that’s certainly algorithmic and that is weird. We continued to refine our software, honing the algorithms we use to find this stuff,” Donovan told The Atlantic. Now that he knows where and how to look, he could spend all day for weeks just picking out these patterns in the market data. His examples can still be found online.